Birch, D., R. Brown and S. Parulava. Towards ambient accountability in financial services: shared ledgers, translucent transactions and the legacy of the great financial crisis. Journal of Payment Strategy and Systems 10(2): 118-131 (2016). The consensus in the finance sector seems to be that the shared ledger technology behind Bitcoin, the blockchain, will disrupt the sector, although many commentators are not at all clear how (or, indeed, why). The blockchain is, however, only one kind of shared ledger and the Bitcoin blockchain works in a very specific way. 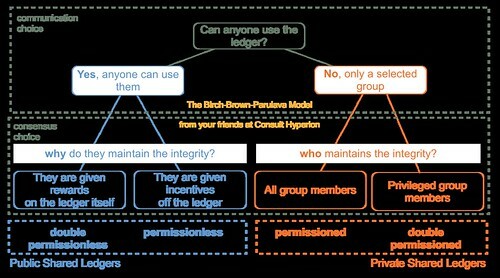 This may not be the best way to organise shared ledgers for disruptive innovation in financial services. So what is? And why would financial services organisations want to do exploit it? Transparency increases confidence and trust. I often use a story from the August 1931 edition of Popular Mechanics to illustrate this point.